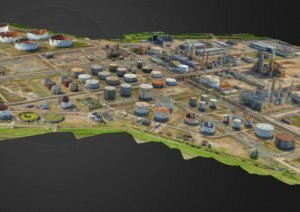 Using our drone equipment and experience, we’d been commissioned to map Thames Oilport’s 640-acre oil refinery, and provide detailed analytical images. We arrived on a misty Tuesday to the gates of the refinery near Southend in Essex – over the next few days we were going to get to know this place very well. 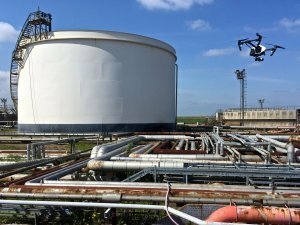 Recent advances in UAV (unmanned aerial vehicle) technology have brought a host of survey and inspection solutions to a price point which is accessible to an ever-growing number of organisations. 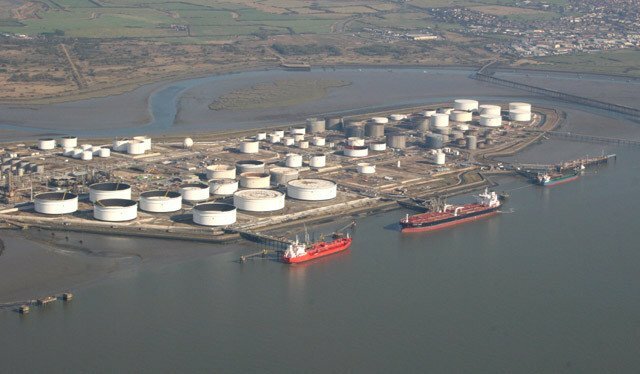 This enormous site on the Thames estuary, next door to the super-hi-tech London Gateway shipping terminal, houses a decommissioned oil refinery. Production ceased here in 2012, and the vast majority of the site is currently undergoing demolition with much of the land being sold for redevelopment. Once we started chatting and they found out about the other services Skyhook provides, the plan snowballed beyond aerial video into a multi-faceted brief involving orthographic mapping, 3D modelling and high-detail inspection. We’d been contacted by Thames Oilport (TOP) management a few months ago, after they’d found our website whilst looking for a suitable drone operator to film some PR material. These tasks would have cost a huge sum if performed in more conventional ways, and TOP understood the savings that our work would bring them. 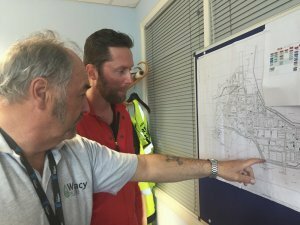 Once we’d arrived, and after going through a thorough site induction and written test, we were given site access passes and returned to the TOP offices for our briefing. We were teamed with Chris Swindles, handlebar-moustachioed site superintendent, local legend, and 3rd generation family member to work on the Oilport site. He’s one of those Real Characters you meet every once in a while, who doesn’t take any crap and tells you exactly how it is. He knew the site like the back of his hand having worked there for the past 40 years, so was the perfect partner for our task. With paperwork complete, work permits signed off and Southend Airport ATC notified of our flight activities, our first task was to fly the length of the 3.5km moat system surrounding the site, to film it for inspection. This moat acts as a drain for any site spillages, and also prevents any contamination from leaving the site and entering the local water system. We were mainly looking for any oily water, blockages, or oil contamination points in the moat. These would need to be cleaned up to return it to full operation as the moat will continue to function after the oil refinery is removed. The moat filming took us just under a day. It was amazing seeing the wildlife we came across – cuckoos, peregrine falcons, and a few giant hares popped out at various points. This would make sense – three years of non-operation would tend to allow the nature in, and the tall chimneys and complex maze of pipework and infrastructure make ideal shelters for numerous species. Our next task was to map, or to ‘orthomosaic’ the whole site, which represented the bulk of our work for the week. Imagine a Google map but with a higher level of detail, and with bang-up-to-date images. This site was to be the largest area we have yet covered in an orthographic survey, so a certain amount of planning was required to ensure a successful mission. Using our chosen software Drone Deploy, we set the drone on an autonomous flight path, covering our chosen area with straight line, grid-pattern flights. The camera points straight down and captures images at a set interval which gives a degree of overlap, to allow the photos to be stitched together afterwards. Unfortunately, autonomous flying doesn’t just mean we can sit down with a cup of tea and the paper – by law the pilot must maintain visual line of sight (VLOS) with the aircraft at all times, to monitor its position and be ready to regain control and return to manual mode if anything untoward should occur. Our aircraft performed flawlessly, holding position well during flights, even whilst being buffeted by cross winds. 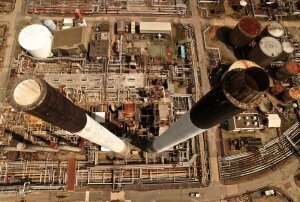 Our final task was to capture more detailed aerial pictures of 25 different contamination areas across the site. These had previously been identified in an environmental report, and will all need to be cleaned away before the land is sold on, in order for Thames Oilport to keep to its environmental remit. These areas include oil leaks or other chemical spillages which have occurred at the site over the years. If you wanna make an omelette, you gotta break a few eggs, right? Erm, substitute ‘eggs’ for ‘crude oil’ and ‘omelette’ for ‘British economy’ in this analogy, and that should hopefully make sense! We worked with Chris Swindles to arrange the locations into the most efficient order and minimise distance driven across the site. We stayed focussed, shared the flying to minimise pilot fatigue, kept on top of battery charging, and developed a good system of capturing the required images in the most efficient way. Come the magic time of 4.30 on Friday afternoon, we were back in the office and showing the client some amazing images from the flights, straight off the SD card. Having left a section to process over the afternoon, we were also able to show them a few drafts of the 3D models we had generated that morning. On the way home, we took stock of the fact that we’d mapped, surveyed and 3D-modelled a 640 acre site in less than a week. And we were pretty chuffed! We knew we had provided the client with a data set which would have been prohibitively expensive to obtain using more conventional methods. We’d done so in a realistic time scale, and with a high level of flexibility. By engaging a qualified and experienced flight crew, companies requiring mapping, survey and inspection services can truly benefit from new opportunities brought by today’s drone technology.